Home » sake and food » cooking with sake #1. david drew. cambridge brewing company. cooking with sake #1. david drew. cambridge brewing company. When thinking of Sake and food pairings, your mind might jump to Japanese food: mainly sushi. The idea that Sake is a beverage only to enjoyed with sushi could not be further from the truth; this complex drink goes well with many different cuisines and flavors. To highlight this, I will be working with Boston-area chefs to show the versatility of Sake with many cuisines by introducing them to good Sake and simply letting their creativity take over. The restaurant world has always been populated with a wild array of characters with different backgrounds and motivations. 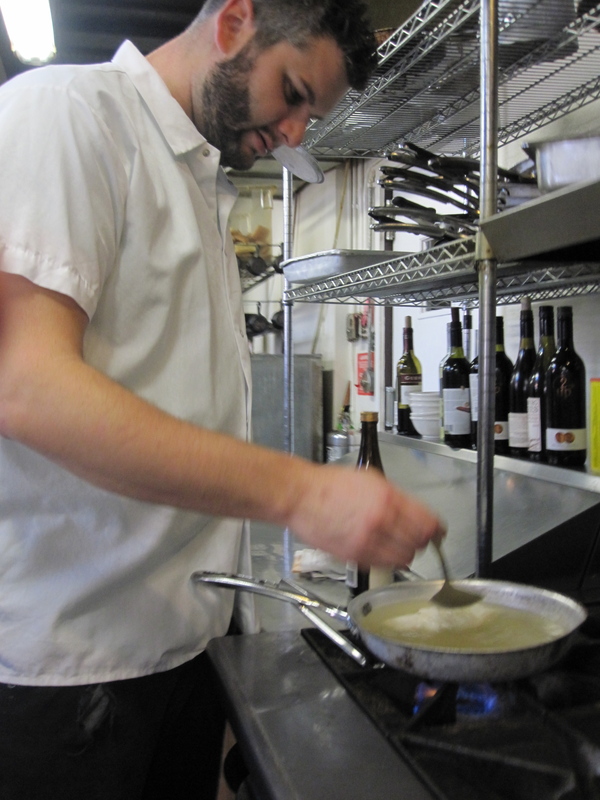 David Drew, Executive Chef at the Cambridge Brewing Company is no different. Driven by a love of cooking and a desire to escape a cavalcade of odd jobs including chimney sweep, he worked his way up through the ranks of Boston restaurants with an eye toward improving his skill. It is this journey through the trenches that fosters respect for the ingredients and a belief that the real engine that drives the kitchen is the hard work preparing ingredients and setting up mise en place before a single customer sits down. It is this mindset that made me want to reach out to David. 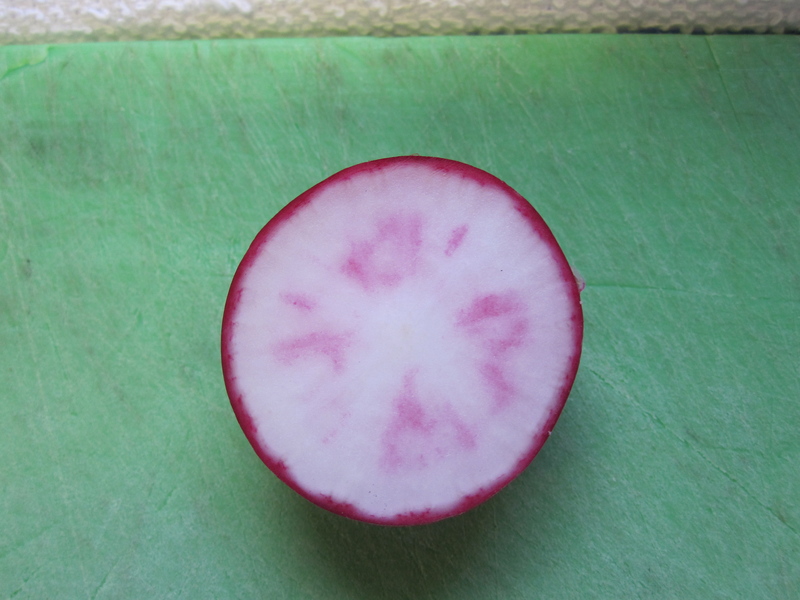 The inspiration for the dish came from the Sake itself. 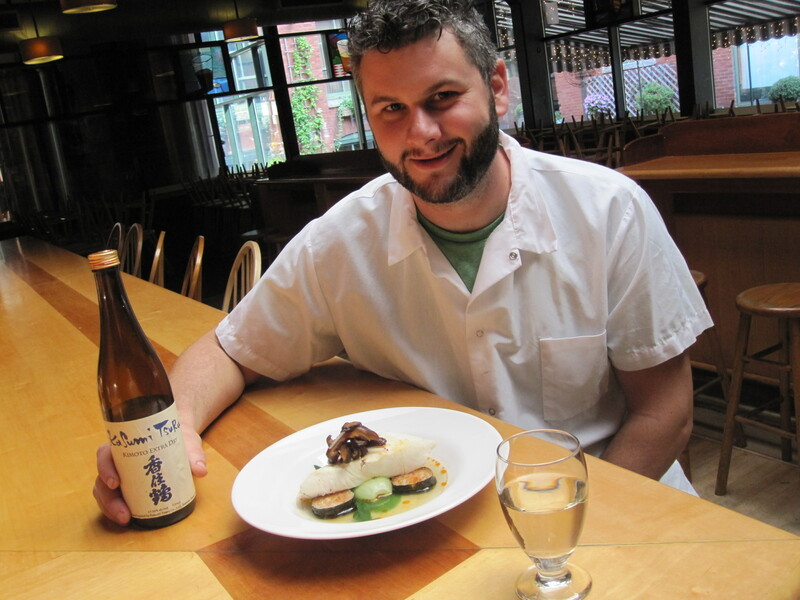 The dish is an exploration of the flavors that David was surprised to find in the Sake. 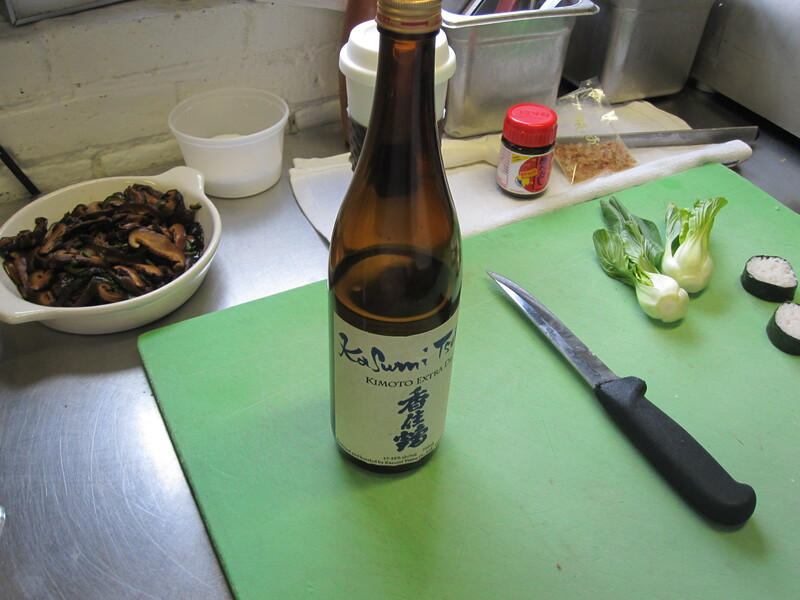 The Sake I selected was Kasumi Tsuru Kimoto extra dry. This earthy and complex Sake, made using the Kimoto method (older fermentation style) is expressive with flavors of mushroom, Koji, sweet rice and a bit of black pepper spice. 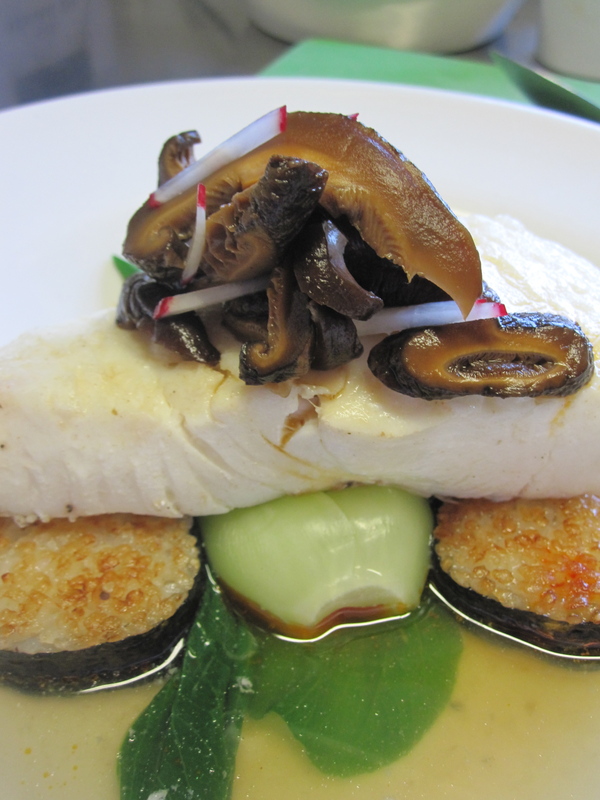 The Dish: Sake-poached Nova Scotia Halibut, seared maki roll, Bok Choy and pickled shiitake mushrooms in a Sake/dashi broth. After setting up the mise en place and other standard kitchen prep work, this dish snapped together quickly. Making me think it would translate well to a home kitchen. The night before, David had marinated reconstituted shiitake mushrooms in a mixture of rice vinegar, sugar, ginger and some chiles. 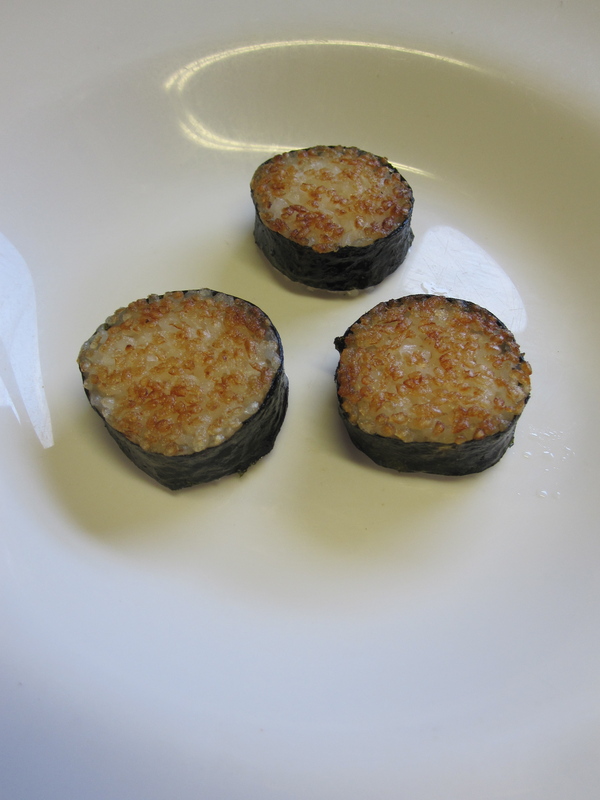 Small maki rolls were made simply with sushi rice (rice, vinegar, salt, and sugar) wrapped in nori seaweed and sliced. Lightly pan fried, these maki added great crunch and a ricey/earthy layer to the dish. The bok choy was handled with respect for fresh local ingredients: lightly blanched in salt water then iced to stop the cooking. 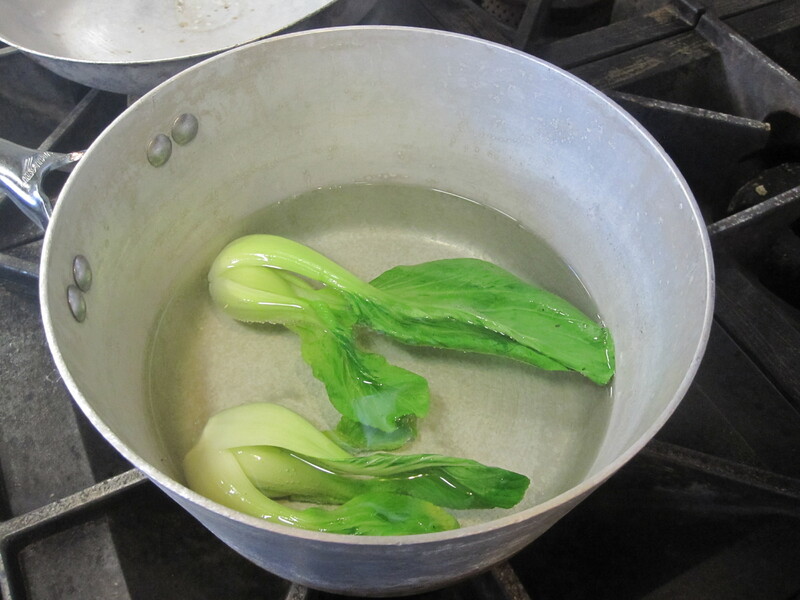 These bok choy would later take a short swim in the broth next to the fish to heat them through, while maintaining their color and freshness. 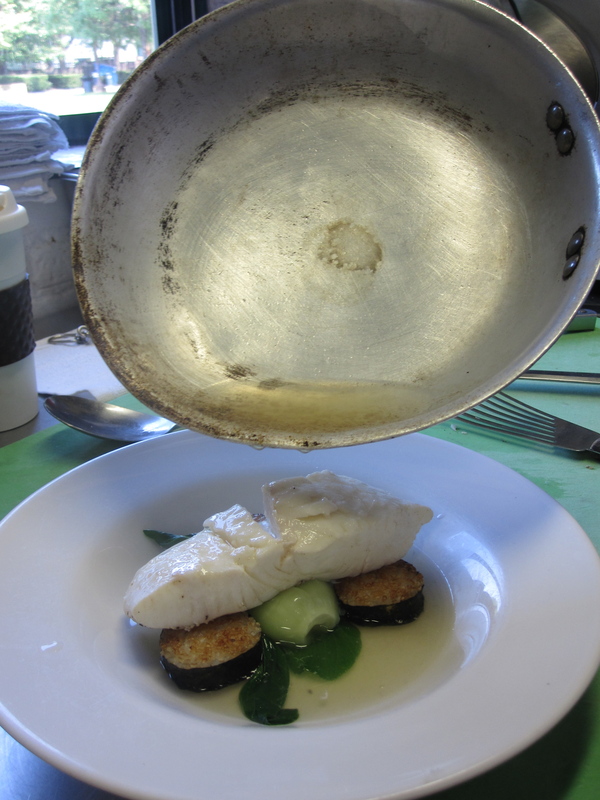 Before assembling this dish, the last step was to cook the fish. The gorgeous piece of Nova Scotia Halibut was lightly salted and peppered. David put black pepper on only the underside of the fish, allowing the trapped moisture of the fish to extract some of the flavorful oils from the pepper, but also allowing him to present the fish to diners without visible black specks marring the perfectly clean white flesh. The fish is lightly poached in dashi, a Japanese stock made with dried fish flakes; a broth delicate with subtle smoke and ocean flavors. The key is putting the fish in the stock from the beginning and letting the two come up to temperature together thus avoiding shocking the fish in hot stock. Once the fish started to cook, the pan was topped off with Sake. 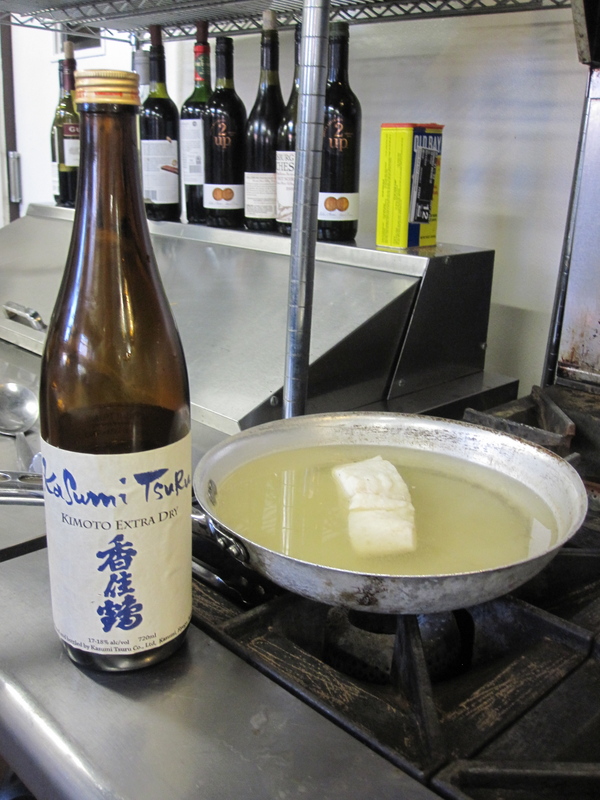 Adding the Sake late in the poaching time allows the delicate flavors of the Sake to enhance the fish and not simply get steamed off – many of the delicate flavors of Sake are volatilized with heat and are lost in high-heat cooking methods. Assembling the dish was done with care for composition, making sure the diner can see all the components and keeping the items in the bowl in there natural state. Once assembled, David flashed some of the poaching liquid in a pre-heated pan to quickly drive off some of the water and concentrate the flavors. This broth, along with a dash of house made chili oil was used to finish the dish at plating. 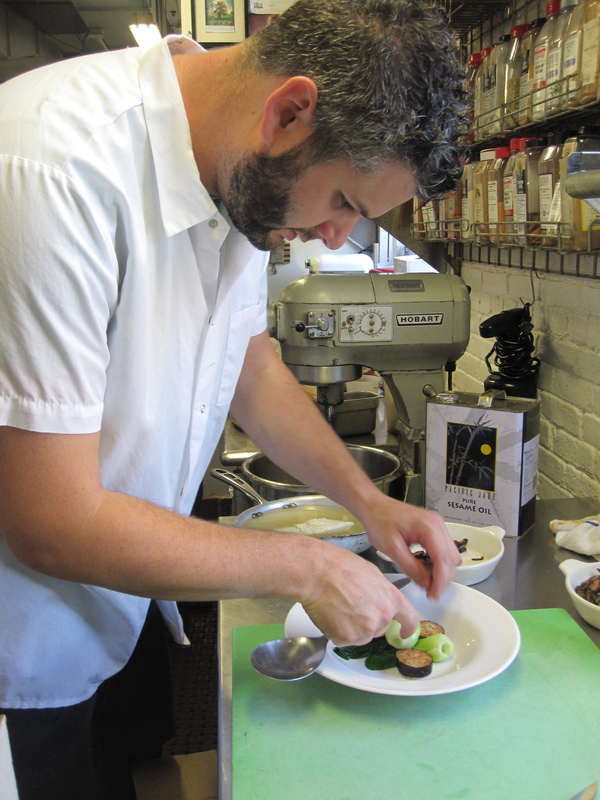 David’s dish is an inspired look at how a talented chef can taste something like a great Sake and instantly see how the flavors of that liquid can be taken apart and celebrated in a skillfully made dish. The flavors of the Sake can all be found in that bowl: the earthiness of the pickled shiitake and the nori, the lightly toasted rice, the delicate mineral notes from the dashi, and the brightness of the fresh local bok choy. Upon tasting, you realize that the flavors are only part of the magic of this creation. The textures play an important role, too. The creamy white fish layered with the crisply toasted rice, silky broth, and firm pickled shiitake, all recall the sensations of the Sake, and, in doing so, elevating it. To experience more of the creativity above, head on over to the Cambridge Brewing Company where David and his team deftly cook some great food, with an eye towards locally sourced ingredients, to complement the house brewed beers by Brewmaster Will Meyers.